Встречала в Тирисфальские леса на берегу севернее Фермы Гаррена. Очень маленький как ступня игрока ! In Danish its called a "Søagurk" Sø = Sea, Agurk = Cucumber.. Hehe..
Found a Sea Cucumber at coords 53, 42 in Vash'jir, Shimmering Expanse. For those without coords, that is directly northeast of Nespirah. It is on the sea floor. Rockchewer Whelks are in the exact same area as well. They are the snails on the sea floor. For the achievement To All the Squirrels Who Cared For Me. Although Морской огурец is not actually a cucumber, it does need some love too! Make sure you select the Морской огурец and /love the little grub to fulfill one of the requirements for the achievement Всем белочкам, которые были ко мне добры. 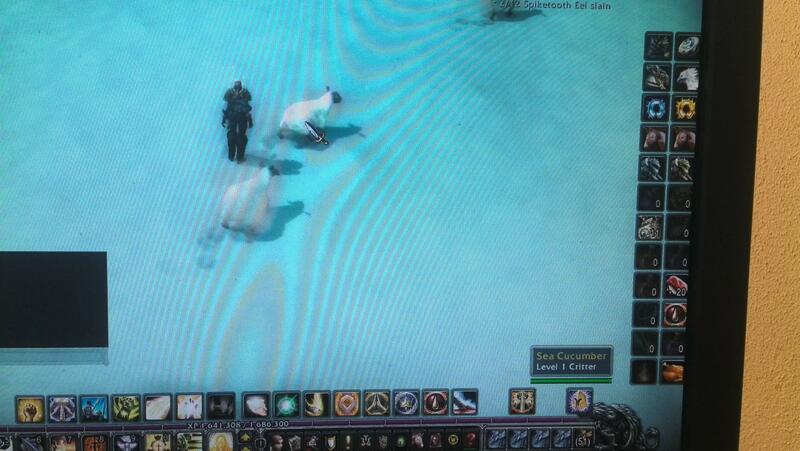 Apparently these Sea Cucumbers look like sheep now? Этот NPC может быть найден в следующих зонах: Мерцающий простор (27) и Бездонные глубины (3).